While we were discussing if Vinho verde was white or green, I remembered this sample in my fridge. It opened up our minds about Vinho verde with its dark watermelon color. So festive on a chilly Sunday. Its yeasty almost beery aromas and fresh spritzy red fruit flavors make it a super fun option. Made using traditional methods and by blending 60% Vinhão, 30% Borraçal and 10% Espadeiro. by the folks at Las Lilas by Jose Oliveira, the winemaker. The winery sits on the banks of the Duoro river in Portugal at an elevation of about 1000 feet. Meant to be consumed while young, this might be hard to find, but at a <$12 price point, with its pretty bottle and easy drinking nature, it's worth looking for. 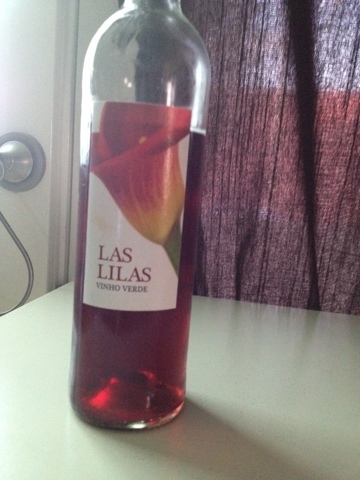 I had tried the white version and didn't like it as well as this rose, which is fresh, with a nice juicy finish. Just what you need to remind you that summer is coming...eventually.